Lots to talk about from NYSED's suggested proposals to the new new evaluation system (see the PowerPoint here). They vote tomorrow and the proposals will almost certainly be adopted. See the PowerPoint here. See the detailed commentary (from Carol Burrus) here. See DR's repost of Burris' here. And, yeah, that's just about it. No one seems to like details these days. So the next stop will be the negotiation procedure between the NYCDOE and the UFT (all districts and their unions). In the meantime, here are the details that no one seems to be concerned with. HEDI score will be decided locally. This means that the NYCDOE and the UFT will decide where the cutoff for HEDI is going to be. Look for an advance email in a year or so. These will look more like the GPA you and I received in college and less like the scores we received on spelling quizzes in elementary school. An "H"=4, "E"=3 and so on. Each component is graded like that, then the total amounts will be averaged; justlike a college GPA. The principal/supervisor's observation is going to be worth at least 40% of your overall score and won't be worth more than 50%. Whether it's 40 or 50 (or even 35) will be all be locally agreed between the DOE and the UFT. Why? Well, the independent evaluator is going to happen. That score will be worth a minimum of 5%. In addition to that, city teachers should expect a peer evaluator worth another possible 5% of overall score, to, materialize. If a principal observation is worth 40% and the two evaluators are each worth a possible 5%, then that is from where the 50% of the observation score will come. Every single teacher in the state will have one unannounced observation (#ThanksCuomo) and live video recorded observations are now possible. They're still worth half of your score! In fact, right now, only one is worth half of your overall rating. The law is pretty clear for teachers who do not teach grades 3-8, ELA/Math. For those teachers (80% of us), we will work off of Student Learning Objectives (SLOs). If we teach a course that ends in a test, the SLOs will be measured along the test we teach to. If we don't, then, well, they don't quite know. Everyone talk about grades 3-8, ELA/Math, but those folks are like none of my audience, so I'll just say that they will be working to improve the growth scores. Ok. Now for some brief, modest commentary: The screengrab below, from page one of the PowerPoint that SED put out yesterday, really says all that needs to be said about this whole entire evaluation system. On the surface, it feels like they just can't seem to get this thing right. Of course, a closer examination might reveal why they can't get it right: Its reliance test scores make it completely unworkable. No manifestation of an eval system that relies on test scores -scores the teacher has less than 30% sway over creating*- can work. The folks who say that the whole system will eventually collapse under its own weight are, of course, correct. 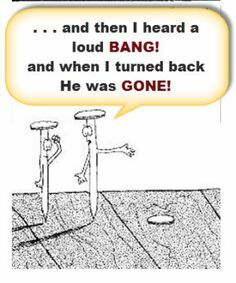 Until that day comes, we'll all just be confused and maybe even laugh a little at the absurdity. We'll probably be right back here in a year, or two, examining yet another version of APPR (6.0). One other takeaway worth mentioning: That is a far cry from just four years ago, where a principal's observation was worth 100% of the overall score. Chancellor Klein rubber stamped any and all principal ratings and, whether the teacher was good or horrid, the 'U' the principal used to give stuck. Now, you'd have to be bad according to the principal, and two other observers, and two tests in order to get that 'U' (now called an 'I'). Say what you want about this system (I do), but whereas before, only one measure -the principal- could end a career, now a five different measures will have to lined up against you in order to do the same thing. Principal autonomy? Oh, how the mighty have fallen. Last thought: New York City teachers will probably have two tests. The first will count for 30% of our overall score and the second will count for 20% of our overall score. They will no longer be able to cut the same test two different ways, the way they do now, so we will probably have two separate standardized exams (this is IF the UFT and DOE can pull it off. If they can't then it'll wait another year until they figure it out). That's a win for us (because we're only ineffective if both exams come back as such) but it's a loss for our students. Stupid stress and a diabolical departure from the love of learning are the real winner when high stakes tests are on deck (even HST for teachers only). 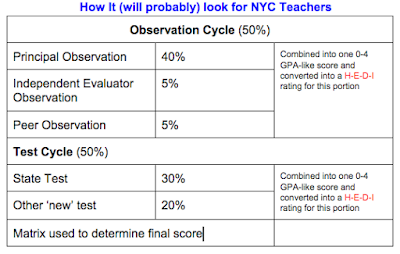 I'll leave you with how it may well wind up for NYC teachers (note the words "may" and "NYC"). *See me in the comments if you want me to explain this. It's not complicated. Just math, actually.